The Berkeley Chamber of Commerce has responded to private businessman Brian Dennard of San Diego, who is spearheading an economic boycott against the city of Berkeley, California, after their City Council declared the US Marines "uninvited and unwelcome intruders." Mr. Dennard was gracious enough to forward us a copy of their response to his earlier letter. It is a weak appeal, which essentially begs, "Please don't punish the businesses in Berkeley for the actions of the city council." The Chamber claims that many of the business owners don't even live in Berkeley, and thus had (and will have) no vote in electing the city leadership. Why would anyone set up a business in a jurisdiction in which they have no voice, leaving the control over the business environment to others? "The business community was not notified of pending city council action, nor asked for input." Well, there's no surprise there. Since when does the city council need permission from local businessmen to govern the city? On the other hand, it might have been prudent for the City Council to at least request input from surrounding businesses, before making a decision which no doubt has adverse effects on them because of the regular protests carried out by Code Pink. How much revenue have the other businesses near the Marine Officer Recruiting office lost because their customers avoid the area to escape harassment by Code Pinkos? Perhaps some of them should consider banding together in a lawsuit against the City (as well as Code Pink) for their lost revenue as a result of City Council actions, requiring the City to "make them whole" by reimbursing them for that lost business. Using prior business records should make the issue of damages fairly easy to establish. Before you assert a claim that this was "protected government action," remember that the actions of the city council in advocating interference with military recruiting are a violation of federal law. Can a violation of federal law be "protected" governmental action? I think you'd have a strong argument that local government action that violates federal law should not enjoy any such protection. I'm sure there are plenty of California lawyers (many of them Marine veterans) who would be happy to take these cases pro bono! We ask everyone to try to separate the actions of the City Council and not harm the good, hard-working small business owners - most of whom do not live in Berkeley and therefore cannot vote in Berkeley. Does the City of Berkeley receive revenue in the form of taxes for all business conducted within its jurisdiction? Of course it does. This boycott, therefore, properly hits the City in the pocketbook by denying it that source of revenue. If those "good, hard-working small business owners" do not approve of the actions of the City Council, and do not live in the City of Berkeley, perhaps they should vote with their feet by relocating their businesses outside of Berkeley. Yes, it could be expensive to relocate, but probably not as expensive as the loss of business they will suffer by remaining in Berkeley as this boycott picks up momentum. And given the speed with which the anti-Berkeley boycott has mushroomed, that could be considerable. This is not a movement that will quickly lose traction, as some do. If you've not been following it, just go to your favorite search engine and search on the term "Berkeley anti-military stance." The media outlets and blogosphere have been very active on this topic in the two weeks since the City Council passed its foolish resolution. Senator Jim DeMint (R-SC) has introduced a bill in the US Senate, now called the Semper Fi Act of 2008, that would strip Berkeley of more than $2.3 million in federal "earmarks" in the 2008 Omnibus Appropriations bill, and transfer the funds to the Marine Corps. U.S. Congressman John Campbell (R-California) is introducing a companion bill in the House of Representatives. Hoo-rah! And California Assemblyman Guy Houston (R-San Ramon) will move forward with his proposal to suspend $3.3 million in state transportation funding to the City of Berkeley. We sincerely hope others will follow suit. The Peace and Justice Commission in Berkeley, which made the recommendation that resulted in the heinous resolutions, estimated the fiscal impact to the City of Berkeley as a result of implementing its recommendation to be "Staff time to research the City’s options for enforcing Chapter 13.28 of the Berkeley Municipal Code, discrimination on the basis of sexual orientation, with respect to military recruiting offices in Berkeley." We urge you to show them that the fiscal impact to the City of Berkeley will be far greater than staff research time! "Additionally, we believe that the Berkeley City Council owes an apology to the community and others, whether they be a Marine or a hard-working business owner, folks that are just trying to do their job in this terrible economy, and which is now more difficult because of their actions." No kidding! The Berkeley City Council owes a public apology to every member of the US military, and to every US veteran, and their families! One of the things that is really ironic in this debacle is that the mayor is a retired US Army officer, according to his bio on the city web site. I find it interesting that this fact is not widely reported. He certainly should know better than to claim this war is illegal. Military intervention in Iraq was approved by the US Congress, thus it is properly authorized according to the system of checks and balances that is claimed to be violated. Claiming this is "Bush's war" just ignores reality, which they seem to be very good at doing. Mayor Bates, as a military officer, also knows the consequences of violating military law and federal law. And he should be held to account for his actions. Losing his military retired pay, for at least as long as he and his City Council have been in violation of the federal law that prohibits interference with military recruitment, seems an appropriate result. He cannot hide behind claims that it is the action of the City Council, because he personally has taken part in the protests (see photo below). As an Army officer, Berkeley Mayor Tom Bates took an oath to defend the US Constitution "against all enemies, foreign and domestic." So long as he draws a military retired paycheck, he remains subject to military jurisdiction. Perhaps someone should investigate filing charges against the mayor for conspiracy to interfere with military recruiting, and for actively promoting and participating in interference with military recruiting, and seek to have his military retired pay forfeited. His actions have clearly violated federal law, and have provided aid and comfort to (both foreign and domestic) enemies of the United States. Providing aid and comfort to an enemy of the United States is one of the definitions of the federal crime called treason. 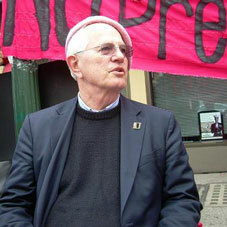 This picture shows Mayor Bates in a pink beret, taking part in the Code Pink protests. If his actions (actively participating in attempts to obstruct military recruitment and providing aid and comfort to the enemy by giving it support for propaganda to say, "See, their will is weakening, we can win.") doesn't amount to treason, at the very least it certainly amounts to "conduct unbecoming an officer," a violation of the Uniform Code of Military Justice (UCMJ). And if Mayor Bates is receiving military retired pay, he's still subject to the UCMJ and could perhaps be recalled to active duty for the specific purpose of a court-martial. That might be the most appropriate justice of all -- to have the federal government remind Mr. Mayor in a very personal way that he's still subject to military law unless he wants to forfeit his retired pay. Of course, in this election year, that's not likely to happen. Just as it didn't happen to Jane Fonda or John Kerry for the aid and comfort they provided to the Communist North Vietnamese government. The only place either of them has been held to account for their actions is in the court of public opinion. While we're discussing "aid and comfort" to the enemy, there are reports that Code Pink's "leader," Medea Benjamin, has sent $600,000 to families of terrorists in Iraq. If that's not providing aid and comfort to enemies of the US, what is? "We feel that granting a parking space in front of the Marine's office is harassment for them and their neighbors, and should be rescinded." Amen! This is a particularly interesting faux pas, and we should make sure it backfires in their faces. The Berkeley City Council has set a precedent for granting reserved parking privileges in front of the establishment of choice for non-profit groups. We urge every non-profit supporter of America Supports You to apply for its own reserved parking space in downtown Berkeley to facilitate its protests against Code Pink and the City Council. There's no basis on which the request could legitimately be denied, as every non-profit is entitled to equal treatment by and similar support from the City Council. By the time the City reserves all those parking spaces for protesting non-profits, there will be no parking space left for business customers, so those business owners would be well-advised to relocate their businesses outside the City of Berkeley. "We're the only group that is opposing council actions." Really?? Then who were all those people on Shattuck Avenue last week, clashing with Code Pink? Perhaps the Chamber meant that it was the only local business group opposing council actions? There are a number of pro-military groups opposing the actions of the Berkeley City Council, including Move America Forward, Gathering of Eagles, and Patriot Guard Riders. And a growing number of business owners as well, thanks to the efforts of San Diego businessman Brian Dennard, who says he has received more than 13,000 emails "from Americans all across the nation, Iraq and Afghanistan who have asked me to continue on with my/our boycott until Berkeley understands clearly that we will not stand for them calling the USMC (or any other branch of the armed services) 'war criminals', 'murderers', 'assassins', etc." He has created an organization called Brigade America to publicize efforts to show support for American service members, and the growing boycott of businesses in Berkeley and every other American city showing a similar disrespect for our troops. As Mr. Dennard says, "YOUR city seems to be hell bent in repeating the sins of the past when you spit on and cursed those returning from Vietnam. WE are hell bent on teaching you that you and your city will never again be allowed mistreat and besmirch the heroes of the United States Armed Forces." To that, I say, "Amen!" The quote with which Mr. Dennard ends his letter to the Berkeley Chamber of Commerce ("Good People Sleep Peaceably in their beds at night only because rough men stand ready to do violence on their behalf.") is widely attributed to George Orwell, but is most likely a paraphrase of a quotation from Winston Churchill, who said, "We sleep soundly in our beds because rough men stand ready in the night to visit violence on those who would do us harm." Code Pink is Protesting Against the Group that Protects Its Rights to Protest! The most ironic part of the whole Code Pink protest against military recruiting is that they are protesting against the very group that guarantees and protects their right to publicly make fools of themselves. In a blog I read earlier today, a poster made the comment that it is our Constitution, not our military, that gives us Freedom of Speech. To which another poster accurately replied along these lines: "Well, if it's the Constitution that gives us those rights, all we have to do is send that piece of paper to Iraq, and they'll instantly have Freedom of Speech, too. Right? Then we could send it to Afghanistan and North Korea, and they would have Freedom of Speech, too." Boy, that would save a lot of money that we wouldn't need to spend on the military! We could slash the federal budget. Do those war protesters truly believe that they would have the opportunity to exercise their rights without the sacrifices, and sometimes the ultimate sacrifice, made on their behalf by the members of our Armed Forces? Perhaps those aged hippies have been partaking of wacky weed long enough that it's fried their brains! That's why the antics of Cindy Sheehan (in particular) always mystified me. How can she not understand that her son volunteered for the military, and willingly gave his life so that she would continue to enjoy the right to stand in front of a camera and mock him and his sacrifice? And those police officers who stood by and watched people being assaulted and battered by Code Pink without taking action? Sounds like dereliction of duty to me, and may be grounds for termination of employment. Oh, wait, the city leaders are part of the gang of thugs promoting these confrontations, so it's not likely that they'll hold the Police Department to account for not carrying out their duties to law-abiding citizens. It's time for a reality check for the City of Berkeley and Code Pink. YOUR right to free speech ends right at the point where it violates someone else's rights. Your rights are not superior to anyone else's. The rogue "government" in Berkeley should be isolated and denied ANY federal or state funds until it is in compliance with federal and state law, and is properly enforcing the laws in its own jurisdiction. If the good people of the City of Berkeley don't want to suffer the consequences of the actions taken by the City Council, all they have to do is remove from office those who violate the law and refuse to properly enforce the law. Or they could just all move out of town, and leave only the lawless in Berkeley. Add your comments about Berkeley's anti-military stance. Berkeley Chamber of Commerce Weak-Kneed Response.